Houses in the UK are often reflections of past users in outdated styles which we force ourselves to adapt to, compromising personal taste and convenience. In light of the demands of the modern lifestyle, Clients often approach us wishing to take control and adapt their houses into homes—as reflections of themselves and as strong responses to their needs. A recent project of ours, 18 Briton Crescent, is a prime example of the exciting results possible through close cooperation between clients and our multidisciplinary team, capable of supporting from inception to operation. Nestled in South Croydon, we proposed a single-storey rear kitchen and dining extension of medium to high-end finish with a gross internal area of 172.7m², well-lit from skylights and with integrated kitchen design. The journey from start to finish demanded a highly considered client-centric design, an expertise in planning, an understanding of the practical implications and the expertise of our Interiors Team. A personable and dedicated approach was taken by Architectural Designer, Seren Yavuz, in order to design a scheme tailored to our client’s palette for contemporary design, their biggest hopes and their smallest desires. Under the ethos that no detail is too small, a deep comprehension of the users’ needs, safety and their natural manner of interaction with space informed the design process, consistently welcoming client input in the evolution of the design. An essential part of this was analyzing the way the client lived and the safety implications of designing with consideration for children. Once satisfied with the proposal the project was submitted to the council for approval prior to implementation. Planning, in particular, is a strength of Extension Architecture. Councils and planning applications can be stressful to navigate but a passionate approach to each and every project and sense of ownership is possessed across the Design Team, who will liase with all necessary parties and remove the anxiety from the process, taking special consideration into means of ensuring the success of applications. This case was no different and Seren personally saw to the approval of the application with Croydon council, showing special consideration to the views of neighbours in her proposal of an innovated asymmetrical roofscape—supporting the application but also embodying the modern sensibilities of the client. This process usually involves submitting an application, waiting up to ten working days for validation and then a further eight weeks for a decision to be made. It is during these weeks that clients can begin to consider the translation of their vision from thought and drawings to actual build. In this case, our client’s budget was £125,000 and we were able to deliver within this budget, at £122,300 (not including VAT). This was the result of the inclusion of a Tender Pack, the relentless value engineering of our team and the involvement of our Contract Administrator (Nadir Kayikci). A Tender Pack can be created to protect clients and contractors in the wake of the implementation of designs. It is an extensive itemized list that can be negotiated, specifying elements of the build from flooring, fittings, suppliers and doors to sockets. As the Contractor’s estimates went beyond budget in this case, we thought out of the box and protected the client’s interests through value engineering. 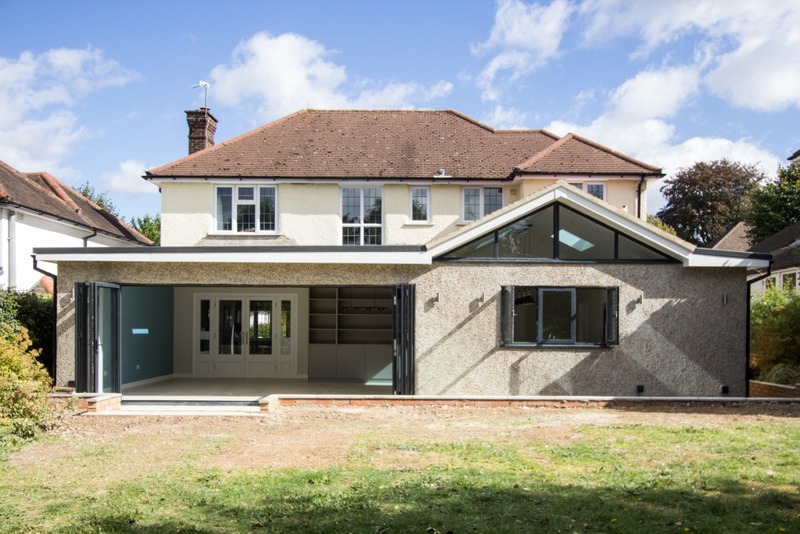 We were discerning with our implementation of underfloor heating—desiring the comfort of the client but knowing where the feature would be an excessive and unnecessary cost from our understanding of their lifestyle. The external bi-folding doors were replaced with cheaper but equally elegant alternatives, we replaced high-end woodwork with a cheaper painted MDF alternative with undistinguishable differences and by specifying alternate electrical sockets we saved the client a further £2000. Additional cuts of cost were made by retaining the roof’s tiles which paid respect to the character of the surroundings and by redesigning the retaining wall of the garden. It was with our special relationships to trusted contractors that we were able to ensure the timely start of works on site and as Contract Administrator, it was Nadir who ensured and oversaw the implementation of the design. Once work started, we faced a unique challenge in the removal of a rather unusually stubborn existent beam which we were able to recognize and resolve with great speed and minimal expense as a result of weekly site visits at the beginning of the construction and close cooperation with a Structural Engineer. After its resolution, bi-weekly site visits ensured a consistently high quality delivery of the design. This quality was further embodied in the work the Interior Team carried out from the beginning of the design journey to the end. A close and trusting relationship was formed between the team and the client after close collaboration. 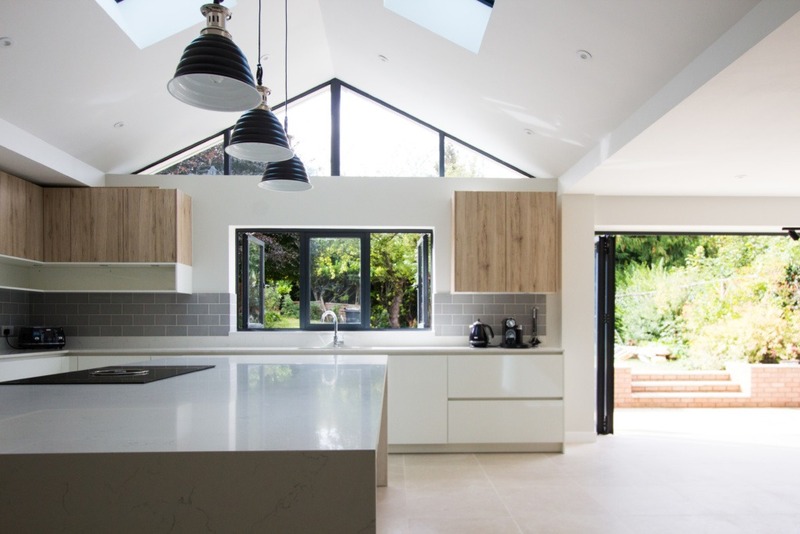 The client wanted the kitchen to be exceptional in appearance but still safe for their child. An understanding of the manner in which the client lives and their personal needs determined the finishes, fittings and the positions of every feature, negotiating their comfort and their child’s safety in making ovens and other dangerous implements unreachable for children but always assuring the client of quality. We understood the budget and the benefit of value-for-money features, in our design and implementation. In the layout we ensured water and gas were positioned in a means to save cost and our collaboration with brands like Hacker, Bora, Nef and Armony offered the clients a range of good quality options at a discounted price. 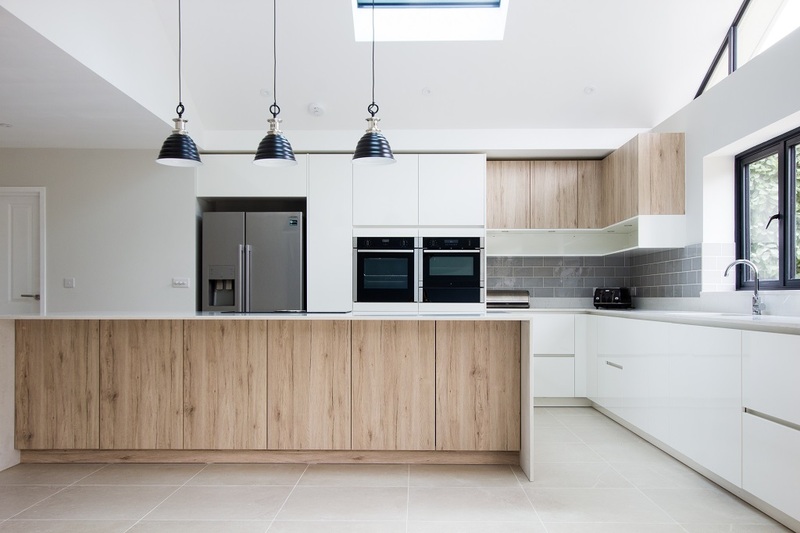 Special features included an integrated microwave, fridge-freezer, and dishwasher as well as a specified hob and a kitchen island, above which pendulum lighting, customized to the client’s height, was featured. 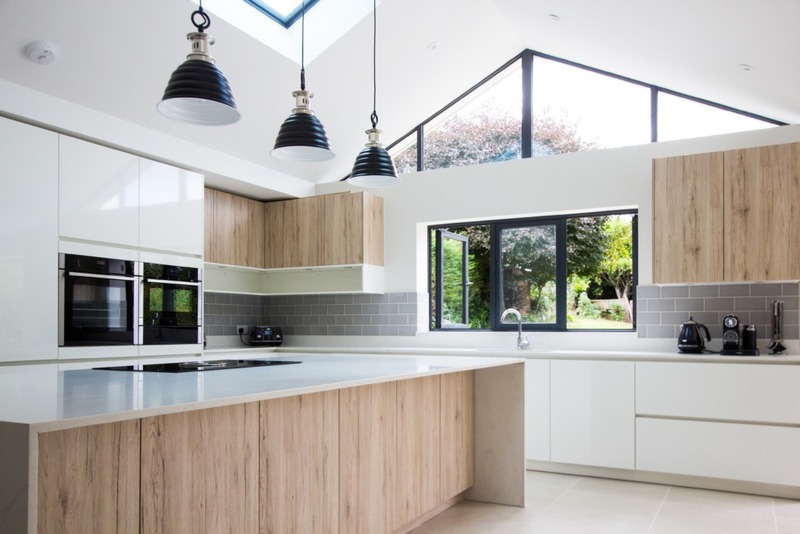 The resultant extension was a bright, contemporary and spacious enhancement of the client’s home, tailored to their personal tastes, boasting a generous and high quality kitchen ready for the family’s occupation. We thrive in making the journey seamless for the client from dream to reality, adapting their homes to their needs and desires.